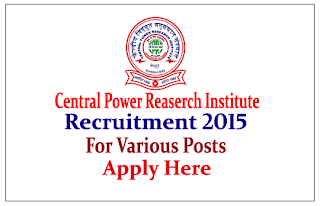 Central Power Research Institute (CPRI) is recruiting for the various posts. Interested and Eligible candidate can apply on or before 10th August 2015. Company Profile: Central Power Research Institute is autonomous Societ under the aegis of the Ministry of Power, Government of India. CPRI has been taking programs in various areas of electrical power generation, transmission and distribution in the endeavor to assist utilities to supply reliable, uninterrupted and quality services to the consumers. How to Apply: Interested and eligible candidate send filled application form to below mentioned address on or before last date. For more details kindly check official notification.